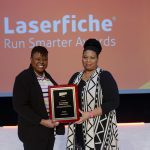 Laserfiche is pleased to announce that three educational organizations have won Laserfiche Run Smarter® Awards for optimizing student services. Arab American University: The first private university in Palestine, Arab American University, provides education for more than 9,000 Palestinian and international students. The university centralized its documents in a Laserfiche repository and integrated Laserfiche with its HR, ERP and student registration systems to enable simple search and retrieval of information. This initiative has reclaimed employee time that can now be spent helping students. Bonneville Joint School District No. 93: One of the largest school districts in the state of Idaho, Bonneville Joint School District No. 93 used Laserfiche to remove paper from student registration in order to make the process easier and faster for students’ parents. The district now ensures accuracy of information and expedites registration, shortening the process from several weeks to just minutes. Linn-Benton Community College: Serving more than 22,000 people each year, Linn-Benton Community College prides itself on preparing students to enter the workforce or continue on to a university education. 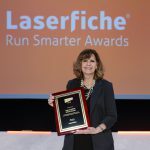 Using Laserfiche, the college streamlined transcript evaluation—shortening the process from eight weeks to one week—while improving communication between the college and its students with automatic progress updates on each transcript.